This page is dedicated to those who have made a difference in my life, who make my days brighter and happier. Those who give me hope and comfort and ask for nothing in return. Most of all, those who i love. "I know i have an angel. And to give me lots of love." They will be with me always, in heart and in spirit. "Just who guides these hands when they're shaking with frustration? When scraping in the sand, who provides the inspiration? And who whispers from the outside when all seems desperation. throughout our lives who care for us. to guide us towards true happiness. who turn up in, most unexpected places. these special spirits who are so needed. their helping hands or smiling faces. 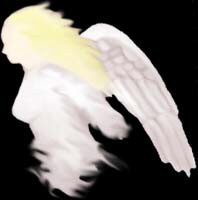 To all of those who are my "angels"
I thank you for all that you have done. and lit my life, when it was dark. but perhaps you already realize that. my heart will always say the words. Amelia, Kit, Miriam, Michelle and Sarah.